Reachwind Eyrie is a Dwemer tower southeast of Markarth and northeast of Dushnikh Yal. This Dwemer tower is perched on top of a large cliff and is surrounded by some of Skyrim's greener pastures. The building in general is remarkably well-preserved, considering the thousands of years it has stood unlocked, overlooking the Karth River. The tower has one interior zone, Reachwind Eyrie, and an exterior balcony called Reachwind Eyrie Overlook. Upon entering, there is a stone bench on either side of the door. Continuing up the winding stairway, you will come to a small room strewn with various Dwemer scrap and Dwemer dishes. There is also a Dwemer dresser which has a 25% chance of containing 1-9 gold, as well as up to three random Dwemer scrap (75% chance each). If you accumulate all the scrap metals found in the room, you can smelt a total of 23 Dwarven metal ingots (more if the random items found in the dresser are smeltable). Apart from Dwemer clutter, there are a few items of interest resting on the desk with the Dwemer banner hanging above it. These include a copy of the Heavy Armor skill book Chimarvamidium, a random soul gem, a random mace, and a random helmet, which can be either light or heavy. Also, there is a chest with an apprentice-level lock containing random loot. There are also two wine bottles lying around the room. Reachwind Eyrie Overlook is an outdoor balcony which is accessible through a door to the left of the desk. 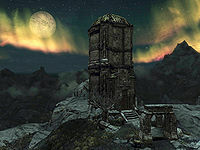 Looking out of the balcony, you will see a spectacular view of western Skyrim. You will be able to see Pavo's House towards the northwest, and Kolskeggr Mine and Sky Haven Temple towards the north. Looking out to the northeast, you can see the ruined Sundered Towers and the tower at Bleakwind Bluff slightly east of it. Finally, if you look towards the east, you should be able to see Old Hroldan Inn. To the left of the balcony door lies a bird's nest containing a pine thrush egg. There is a random one-handed sword resting on the parapet of the balcony. To the right of the balcony rests a chest with an expert-level lock containing random loot.